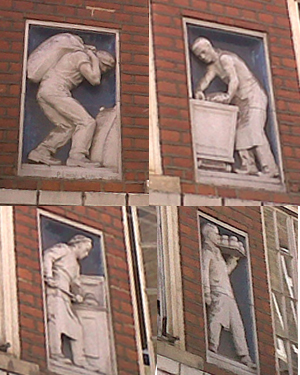 In Widegate Street on the Spitalfields edge of the City are 4 attractive ceramic panels in a row at first floor level of a small brick building. They are white on a blue base and show various aspects of the baker’s work. Presumably when they were put on the building it was a bakery. One is signed by Lindsey-Clark and dated 1926. His dates were 1889-1977. His father was also a sculptor.